In the early 1980s, we began to see an onslaught of animated television shows which were based on toys. Things like Transformers, G.I. Joe, GoBots, Care Bears, and Strawberry Shortcake, just to name a few, came into the homes of kids as advertisements thinly disguised as entertainment. (If I'm not mistaken, this reached a point where rules were put in place limiting the amount of commercials which could be shown for toys based on the show which was airing.) Some see those shows as cultural touchstones of the time, but I've never been one to expect truly quality programming from a toy company. This view has changed somewhat with releases from Lego. While they are clearly meant to "inspire" play with Lego toys, they are also often very clever, as evidenced by their latest collaboration, Lego DC Comics Super Heroes: Justice League: Cosmic Clash. Cosmic Clash continues the adventures of the Justice League, as seen in other entries like Justice League: Attack of the Legion of Doom!. As this tale opens, Brainiac (voiced by Phil LaMarr), a sentient mechanical being, roams the universe, collecting specimens for study and preservation. Which means that he (?) shrinks entire planets and stores them in his spaceship, which is shaped like a skull. The Justice League -- Batman (voiced by Troy Baker), Superman (voiced by Nolan North), Wonder Woman (voiced by Grey Griffin), Cyborg (voiced by Khary Payton), and The Flash (voiced by James Arnold Taylor) -- get wind of Brainiac's approach to Earth and intercept while still in space. Brainiac is defeated and returns to his homeworld for reinforcements. The second attack by Brainiac will be much be calculated and sinister, forcing the Justice League to battle across time itself. The interesting thing about the DC Comics Super Heroes entries from Lego is that they are somehow true to the comic books in the portrayals of the characters, and yet have a completely unbridled and playful approach to the material. For example, one of the main themes in Cosmic Clash is the fact that the Batman is very standoffish and doesn't engage in banter and play with the other members of the Justice League. It's also noted that Batman has contingency plans to take out the other members if necessary, as seen in Justice League: Doom. This idea may seem a bit heavy for something which is ostensibly aimed at kids, but just goes to show how the makers of these movies have done their homework. At the same time, Cosmic Clash can be incredibly goofy at times, as, even for a super hero movie, it refuses to adhere to any reality. This leads to many jokes, most of which come from The Flash, but also some funny moments which hinge of office politics compliments of Brainiac. We're going to be hearing a lot about the Justice League over the next few years, but I don't think many of these offerings will resemble Cosmic Clash. The story combines a menace from space with a time-travel plot (that allows the movie to introduce some DC characters which may be new to some viewers) which isn't exactly original, but somewhat gutsy for something like this. The piece does a nice job of highlighting each Justice League character's strength, with Batman taking the forefront in the second half. The action scenes are well-done, but it's the silly comedy which really makes Cosmic Clash work. How often do we find ourselves laughing Batman's anti-social issues? 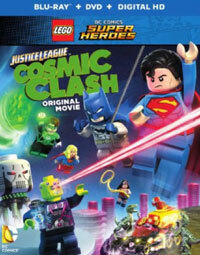 Cosmic Clash represents another solid entry from the Lego animation folks. Lego DC Comics Super Heroes: Justice League: Cosmic Clash enters the energy drink wars on Blu-ray Disc courtesy of Warner Home Video. The film has been letterboxed at 1.78:1 and the Disc contains an AVC 1080p HD transfer which runs at an average of 15 Mbps. The image is sharp and clear, showing no grain and no defects from the source materials. The colors look fantastic and are very bold. The image is never overly dark or bright. The level of detail is good and the image is never soft. The Disc carries a DTS-HD Master Audio 5.1 track which runs at 48 kHz and an average of 2.5 Mbps. The track provides clear dialogue and sound effects. As one would hope, the action sequences sound great, as they offer strong stereo and surround effects, most notably those which highlight sounds which are coming from off-screen. The subwoofer effects are notable, but never overpower the dialogue. The lone extra on the Lego DC Comics Super Heroes: Justice League: Cosmic Clash Blu-ray Disc is "The Justice League: Caught on Camera" (3 minutes). This is a truly odd piece which uses clips from the movie to create a weird short which purports to be a movie directed by Batman. It includes some unfinished animation and test drawings, as well as bloopers.